Solar Energy produced through solar panels is Direct Current, and can be stored in batteries before being used to run your home appliances. 99.99% of your home appliances run on Alternating Current, therefore an Inverter is required to convert the DC electricity from batteries to AC before supplying to your appliances. We suggest that as first step we start by installing appropriate sized solar panels to run your UPS. With this your dependency on WAPDA / KESC for charging batteries of your UPS will end, and your batteries would be charged through solar energy coming from solar panels. 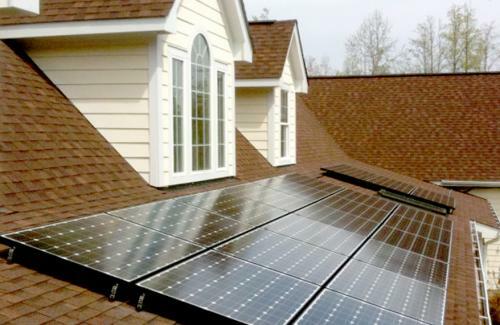 After you have experienced this setup and our services, then later at any time we can add into your panels, batteries and inverter to increase the size of your solar system, and thus producing more energy for running other electric appliances. Daily Energy Usage: As you'd expect, the less energy you need, the less your system will cost. Daily Sun Hours: This is the number of hours your location receives peak exposure to the sun. Percentage of Coverage: The cost of the system will depend on the percentage of electricity you hope to gain from solar. Why is Solar Right For You? Lower or eliminate your electric bill: Power prices in Pakistan are increasing with each passing day, and furthermore long-term outlook for energy prices show a steady increase as well. Power Shutdowns and load shedding issues : Frequent power shutdowns do not allow your existing UPS batteries to be charged. Furthermore, in case of home-sized generators the cost of fuel for these generators is also increasing with each passing day. The Solar system allows you to charge your UPS batteries and also reduce your costs of UPS running on WAPDA / KESC as well as save you fuel costs of running your domestic generator. We calculate size of solar panels, charge controllers, and other items of a Solar System as per your power needs and time duration required by you. Countless customized solutions can be made as per your power consumption and duration requirements.